OTAs are mirroring global macro trends, but are also hurting as airlines cut back on capacity to cut costs. Some of the best-known online travel companies say growing economic uncertainty is causing fewer people to travel, especially in Europe. Shares of the group plunged Wednesday, led by Priceline.com Inc. and Orbitz Worldwide Inc., who both cut their earnings and revenue expectations for the year. Both stocks were among the worst performers in the S&P 500. The travel industry, in general, has remained strong as concerns mounted about the global economy faltering. But there have been warnings, including those from major hotel chains like Marriott International Inc., that slowing international growth may start to cause even well-off travelers to rethink their plans. Online travel companies are also being hurt by airlines’ continued effort to keep costs low. Airlines are cutting flights to save money, which means fewer seats for travel bookers to sell. Priceline.com Inc. late Tuesday reported lower-than-expected second-quarter revenue and warned European weakness would lead it to fall short of Wall Street’s earnings and sales expectations for the year. Priceline’s business is focused heavily on travel to Europe. Several analysts cut their own forecasts on the stock, although many underscored that the more than $100 drop in Priceline shares was an opportunity to buy. Then, Orbitz said its net income and revenue fell in the spring quarter from a year ago, and cut its growth forecast for the year. Its third-quarter expectations were also under what Wall Street forecast. Expedia Inc., a small player in Europe, reported second-quarter earnings last month that fell 25 percent but easily beat expectations. Also last month, TripAdvisor Inc., which was spun off from Expedia in December, reported lower second-quarter earnings and lower-than-expected revenue. In afternoon trading, shares of Orbitz lost 25 percent, or $1.17 to reach $3.49. Priceline gave up 17 percent, nearly $113, to hit $566.88. TripAdvisor fell 5 percent, or $1.98, to $36.68. 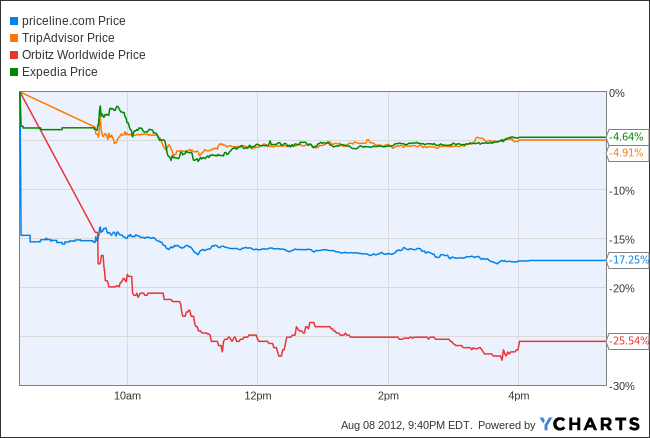 Expedia, which had opened the day lower, recovered and was up 76 cents, or 2 percent, to $36.43.